Rotinonshonni ónhwe - Tkanatáhere | People of the original nations of Turtle Island who belong to families organized pursuant to ancient ways. Ka-nyen-geh-ha-kah (Mohawks) of Grand River support site. 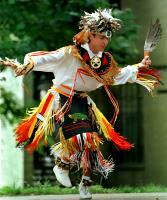 People of the original nations of Turtle Island who belong to families organized pursuant to ancient ways. Ka-nyen-geh-ha-kah (Mohawks) of Grand River support site. I work in support of Ohrerekó:wa, the principle Chief of the Mohawk Wolf Clan of Tkanatáhere (Grand River). I am surprised to learn about the magnitude of what appears to me to be “high risk” financing in respect of the Samsung venture you reported upon on October 22nd. My best guess is that not all relevant parties have been fully informed – and in fact may have been misled. It appears clear to me that at the very least, the public is only being told part of the truth, and accordingly, I would like to provide you with some additional background, context and facts in order that a clearer picture of this fiasco may be reported upon, and appropriately dealt with – bearing all facts in mind. I note that investors and stakeholders who may well be unaware of the totality of relevant circumstances ought to somehow enlightened. 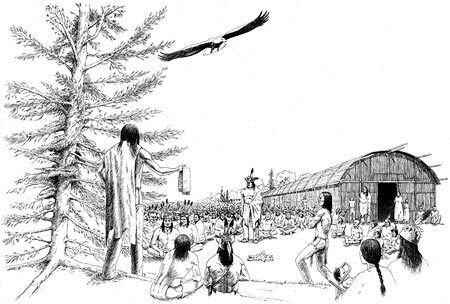 It also appears to me that neither Samsung entities and affiliates, the county of Haldimand, province of Ontario, nor indeed the federal government is saying much about the fact that without the free, prior and informed consent – of ALL relevant parties (such as Ohrerekó:wa who represents the Mohawk Wolf Clan), this venture, which is proposed to take place upon claimed Mohawk lands (See: ​Haldimand’s proclamation of 1784), may well be deemed to be unlawful given that the actions of the parties involved appear inconsistent with the United Nations Declaration on the Rights of Indigenous Peoples. I can advise that Ohrerekó:wa remains committed and poised to seeing that his objections are addressed and that his people’s land be protected from further unauthorized plunder and exploitation. I can further advise that Ohrerekó:wa January 2013 appeal to the Queen (which was acknowledged by Buckingham palace on February 13th, 2013), remains outstanding, and is in the process of being address by the Governor General of Canada, the Premier of Ontario, and relevant Ministers of indigenous affairs at both the federal and provincial levels. 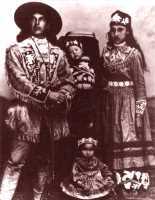 (NOTE: Ohrerekó:wa has been acknowledged by the Crown as the principle chief of the Mohawk Wolf Clan since his appointment in 1972, as evidenced by the attached Confirmation Notice dated November 27, 1972, and as recently as May 13, 2013 in written correspondence issued by the Imperial Crown). It is our position that the “Six Nations’ Elected Band Council” (including the chief councilor, Bill Montour, who with a mere 332 of nearly 21,000 eligible votes, was just ousted in Saturday’s election) can not in any way be seen to represent the people who have a bona fide claim to the lands in question by birthright. In fact, only 5% of the eligible ‘voters’ even took part in last week’s sham elections of Indian Act band councilors, presumably because voting in Canada’s band council system is illegal under the Rotinonshonni ónhwe’s (Mohawk) constitution of the League of Great Peace. I contend that 95% of the eligible voting population is not represented by those who appear to have agreed to – and also appear to expect to profit from – this venture, namely the de facto elected band council which was imposed by force by the government of Canada in 1924 and clearly remains boycotted as a sham to this day. If, at any time, anyone of the chiefs of the League choose to submit to the law of a foreign people, he is no longer in but out of the League and persons of this class shall be called, “They have alienated themselves” (Tehonatonkoton). Likewise, such persons who submit to laws of foreign nations shall forfeit all birthrights and claims of the League of Five Nations and territory. 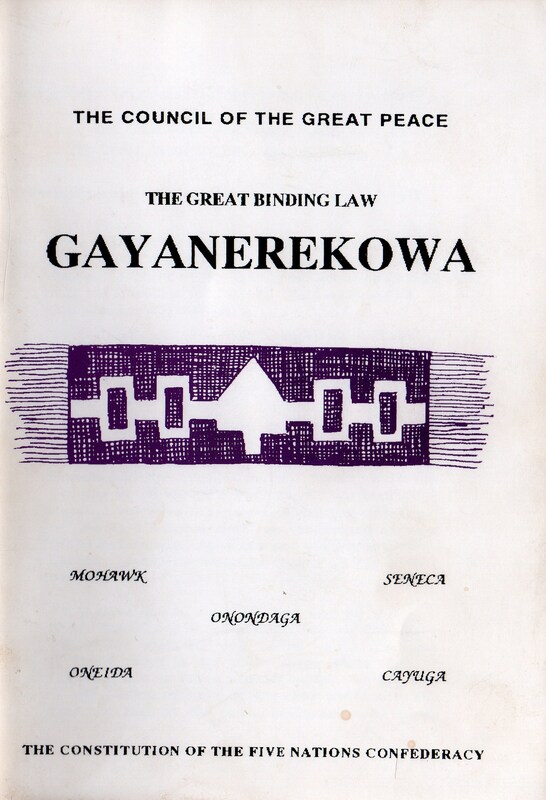 [Kayaneren`tshera ko:wa, Wampum of the 58th part]. 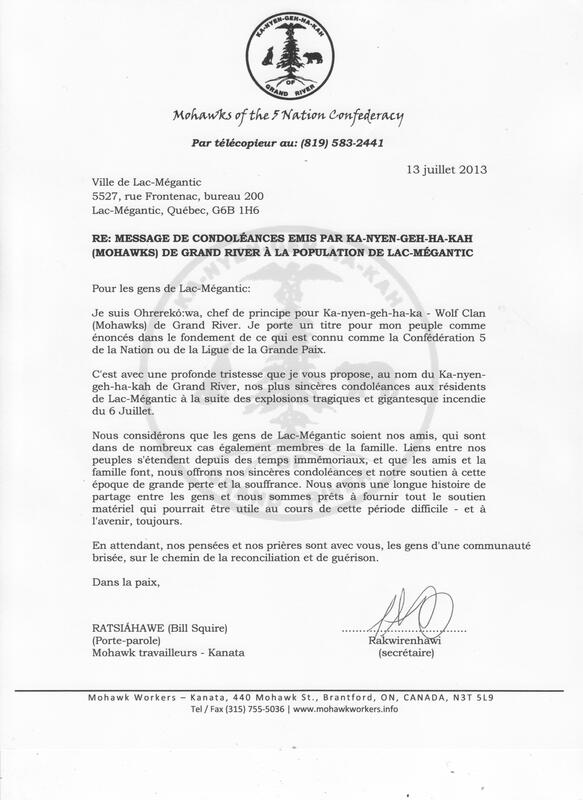 Both Samsung, and the elected band council, as well as the Mayor of Haldimand County, Ken Hewitt, have each been repeatedly warned by the Mohawks about pursuing this venture without complying with the law (see attached 2013 June 26 Letter to Korean Embassy RE Samsung-Six Nations Alert), in the face of Ohrerekó:wa objections. These issues have been raised by Ohrerekó:wa’s office to his ally, Queen Elizabeth II, the Special Rapporteur on the Rights of Indigenous Peoples, James Anaya (see: 2013 May 11 Letter to Jason Bowman from Special Rapportuer RE May 20 Meeting in NY to Discuss Complaint, 2013 May 20 Letter RE Meeting with James Anaya – Special Rapporteur on the rights of indigenous peoples, and 2013 May 20 – UNDRIP chart with links – Articles 1-10), as well as opposition members of parliament and foreign diplomats alike. I find it both startling, and hard to believe, that notwithstanding these well-founded and publicly-stated objections – and moreover, in lieu of free, prior and informed consent of the affected peoples – that any party would consider financing such an evidently risky and oppressive venture, given the myriad of substantial liability issues which can arise and ensue. I have attached some background reference materials for your information, and am happy to forward further details upon request – or to facilitate interviews as requested. What is free, prior and informed consent? To hear more programs and download them as mp3s, click here. According to the UN Declaration on the Rights of Indigenous Peoples, Indigenous communities have the right to give their Free, Prior and Informed Consent (FPIC) to proposed projects that may affect their lands, resources, livelihoods, and communities. This means that Indigenous communities have the right to decide whether they want companies or governments to mine, deforest, or in other ways develop their lands, and they have the right to make informed decisions through culturally relevant processes. Discuss Canadian Manufacturers & Exporters’ trade policy priorities. Diversification Canada’s role in Industrial and Regional Benefits (IRBs) for shipbuilding and resource development including pipelines. Discussion with government officials regarding public policy options relating to the application of information technology to improve efficiencies of energy systems, fire safety and security systems. Discussions with Goverment officials regarding Scientific Research and Experimental Development (SR&ED) program and suggestions relating to development of a manufacturing and exporting strategy for Canada. Discussions with government officials regarding clean water programs, both generally and in relation to aboriginal communities specifically including clean water strategies, initiatives, policies and programs. Discussions with government officials regarding new policies or programs to increase government spending for transportation/transit. Health infrastructure – Discuss with Canada national health infrastructure program with relation to modernization, e-health, and patient records. “The adoption of the [UN Declaration on the Rights of Indigenous Peoples] marked a historical moment of recognition of the existence of indigenous peoples who are characterized by distinct cultural identities, and who have suffered and in many ways continue to suffer, widespread and systematic deprivation of their human rights,” said James Anaya, UN expert on indigenous peoples rights. The Declaration set the international standards for the promotion and protection of indigenous peoples’ rights. Anaya, who was appointed a year after the Declaration’s adoption in 2007, said he had witnessed indigenous peoples striving to realize the Declaration’s vision amid daunting challenges, among which were threats to lands and resources by extractive companies, as detailed in his reports. Chief Wilton Littlechild, Chairperson Rapporteur of the Expert Mechanism on the Rights of Indigenous Peoples, noted that the latest study conducted by the body outlined the issues, challenges and barriers linked to indigenous peoples’ access to justice in truth and reconciliation processes and other contexts, including for women, children, youth and persons with disabilities. “The Study also notes that indigenous peoples have faced considerable challenges in obtaining national and international respect for their right to self-determination due to State fears that recognition could undermine State authority,” Littlechild said. 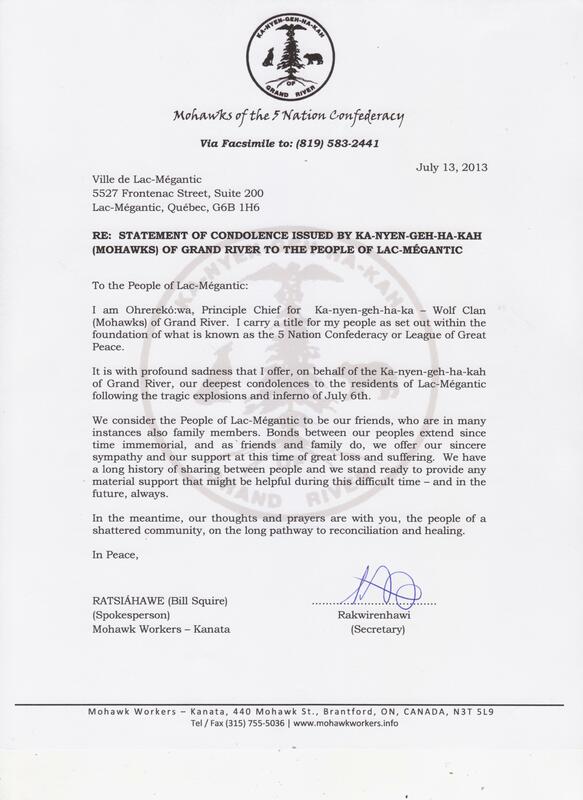 Mi’kmaq Warriors Letter Demands SWN Halt Fracking. According to Martyn Day, a lawyer from the firm, the first step will be to seek a negotiated settlement with the governments of France, Britain and the Netherlands along the lines of the British agreement in June to issue a statement of regret and award compensation of about $21.5 million to the surviving Kenyans. Caribbean countries Jamaica, Antigua and Barbuda already have national commissions on reparations, and each country that does not have a commission has agreed to set one up. The 14 Caricom nations voted unanimously to wage the joint campaign, saying it would be more ambitious than any previous attempt. In the United States, the idea of reparations has surfaced and disappeared numerous times. After the end of the Civil War, about 400,000 acres of land along the Florida, Georgia and South Carolina coasts was taken from former slave owners and set aside for freed slaves, who would each be granted a 40-acre plot of land to farm and make a living. It was the first attempt in the U.S. at reparations, and was reversed by President Andrew Johnson after President Abraham Lincoln was assassinated in 1865. Most recently in 2008, then-candidate Barack Obama said he did not support reparations for the descendants of slaves, which put him at odds with the NAACP, The Urban League, the SCLC and about two dozen members of Congress who sponsored legislation to create a commission on slavery. The House issued an apology for slavery in July 2008, and the Senate followed suit in 2009, but neither mentioned reparations. Caribbean officials have not specified a monetary figure for the lawsuits, but Gonsalves and Verene Shepherd, chairwoman of the national reparations commission in Jamaica, both mentioned the fact that Britain at the time of emancipation in 1834 paid 20 million pounds – the equivalent of 200 billion pounds today – to British planters in the Caribbean. REXTON – Anti-shale gas protesters served notice of eviction Tuesday on the company exploring for natural gas deposits in the Rexton area, giving them until midnight to leave the province. However, it remains to be seen what that means. As of early evening, SWN equipment was still sitting where it has been all week, barricaded by mostly native protesters inside a Rexton compound; Route 134 was still shut down by protesters and the RCMP, SWN had not been served with any documents and nothing much had changed since the day before. “We have been compelled to act to save our water, land and animals from ruin,” Chief Arren Sock of the Elsipogtog First Nation said at the scene of the protest and encampment. To further advocate for the rights of Onkwehon:we (real people who live naturally) worldwide, Cultural Survival, an “Indigenous Peoples’ Rights Organization” based in Cambridge, MA, launched an innovative new radio series in June, 2013 to spread the word about the right of Indigenous Peoples to Free, Prior and Informed Consent (FPIC). Cultural Survival is producing and distributing a series of radio programs on the UN Declaration on the Rights of Indigenous Peoples to inform Indigenous listeners about their rights under international law. Working with communities to develop their own guidelines based on their unique experiences and cultural perspectives, Cultural Survival’s new radio series aims to build capacity, reinforce self-determination, and assist communities to organize to defend their rights. Listen to the programs at consent.cs.org. The principles of Free, Prior and Informed Consent seek to ensure that a given community has the right to grant or withhold consent for proposed projects that might affect their lands, resources, and territories. Development projects seeking to exploit marginalized areas at low costs often do not take into account the considerations of Onkwehon:we who have lived on and protected these lands for countless generations. FPIC’s emphasis on “prior” consent indicates that Onkwehon:we should be involved in the early planning stages on any development project and before any decisions take place, thus bolstering the opportunity for Onkwehon:we communities to have a voice in how the development process takes its form. The principles of FPIC are enshrined in the UN Declaration on the Rights of Indigenous Peoples and the International Labor Organization (ILO) Convention 169. To bring home the idea on the local, rural level, Cultural Survival seeks to translate these programs into as many Onkwehon:we languages as possible, with plans already in motion to record in Navajo, Hopi, Hawaiian, and at least six Mayan languages in Guatemala. The initial 20 programs are already available for download in English and Spanish. The programs’ target audience is Indigenous Peoples in rural communities globally, via a growing network of community radio stations in over 25 countries. Community radio is an excellent tool for spreading this message, explains Rosy Gonzalez, a Kakchiquel Maya of Guatemala and the Spanish-language producer of the series. This first series, made possible by a generous grant from the Christensen Foundation, consisted of: ten 30-second public service announcements; ten 60-second short programs; six 3-minute interviews; and two 10-minute features including interviews and analysis. Cultural Survival welcomes comments and feedback and any who are interested in collaborating on these programs to reach our producers via email at consent@cs.org. “It is important to spread the word among Indigenous communities about the international instruments available for mobilization in struggles for their sovereignty and self-determination. Cultural Survival’s radio programs concentrate on the principles of FPIC in order to make that knowledge free and accessible to Indigenous communities worldwide. While questions remain concerning the determinations made as to who might be affected by a particular development project, what it means to gain recognition as an Indigenous community, and to what member(s) within a community will serve as interlocutors to state and corporate interests, it is important to begin the dissemination of information and grant access to international rights for people calling on governments to respect, protect, and fulfill their obligations under international law,” says Mark Camp, Cultural Survival Deputy Executive Director. Also, Yotinonhsonni onhwe (The people who belong to the Original Family & who work to ensure traditional peace – Gayanere:kowa – endures) of Grand (River) Valley at Brant’s Ford – have commenced a weekly internet radio call-in show broadcast to the four corners. 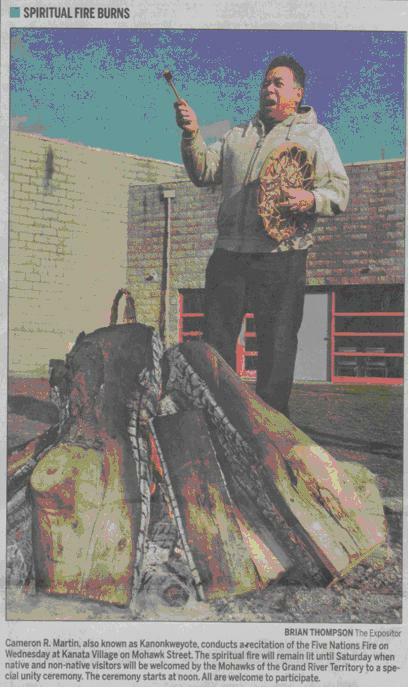 Back in 1990 after the “Oka” Crisis, Mark Maracle and other Mohawks met with us in Roseau River to discuss how we reacted to the crisis. We agreed that we were not as organized as we needed to be, that Warrior Societies needed to be more prepared for the eventual conflict with government. Conservatives in 1990 under Brian Mulroney had no respect for our people and Harper is much the same way. The difference is in how prepared we as Warrior Societies are twenty-three years later. The Treaty 1-11 meeting in Onion Lake, Saskatchewan July 14 to 18 will be a chance for the people themselves to plan and carry out action to meet the current crisis in Canada. AFN will have their own meeting the same time. There is a break taking place between AFN and those First Nations that are tired of AFN. Only the Chiefs are allowed to speak at AFN summits. I told Mark that the biggest event in the 1990 Oka Crisis was the railway blockades that took place in Ontario. Two First Nations blocked railway lines. This was the biggest economic impact of the Oka Crisis. Mulroney gave the people in the Treatment Center 48 hours to surrender or he would send in the Army and take them out regardless of the lives that might be lost. We in Manitoba reacted to the Mulroney threat. I stood up on the legislative grounds steps and announced that if Mohawks were killed, we would target Ford, GM, Chrysler, Alcan and of course we were talking blockades of railway lines. 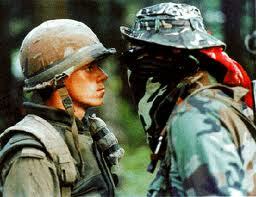 The Canadian army was setting up to kill our people. Of course, we would have reacted, but the trouble is that we were severely unprepared in 1990. Today, we are much better prepared. Treaty 1-11 is not government funded but AFN is and AFN has always been used by Government to keep our people in line. Watch AFN come out from their summit with messages of caution and calls for calm. Watch Government offer appeasements of cash to the Chiefs. The time for the people to have a say in this is now and Onion Lake maybe the place to do that. We will see. The Train Derailment is being hushed up. It is not front page news because as Douglas Bland warned, the railway lines cannot be protected and the oil pipelines are all in Treaty 1-11 territories. 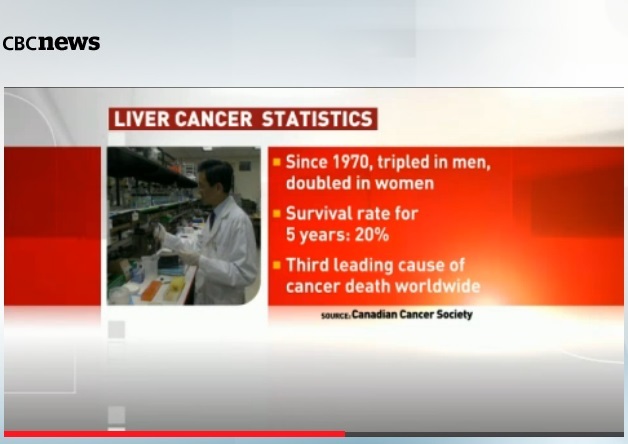 Thanks again for your continued efforts to keep people informed. 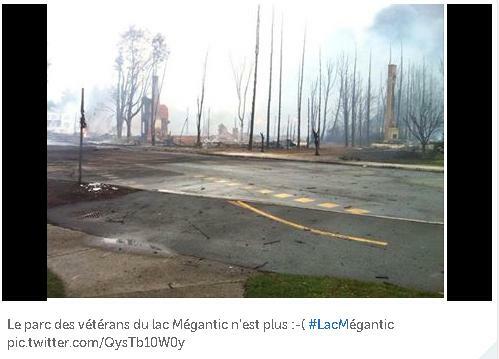 Learn about PM Harper’s visit to the affected area on Sunday 7/7/2013, where he stated that an “unbelievable disaster” had befallen Lac-Megantic, which is around 250km (155 miles) east of Montreal. He was referring to Saturday’s pre-dawn explosion when runaway crude tankers sent fireballs and black smoke into the air, killing many, and forcing the evacuation of 2,000 people as the area became instantly polluted. We understand that according to the corporation responsible, the Montreal, Maine & Atlantic train had been parked in the village of Nantes – about 7km (4 miles) from Lac-Megantic – during an overnight driver shift-change. However, its 73 cars carrying pressurized crude oil tankers somehow became uncoupled from five locomotive engines, gathering speed as they rolled downhill before derailing in the heart of the town of Lac-Megantic. Bernard Demers, who runs a restaurant near the blast site, said the fireball that followed the derailment at around 01:00 (05:00 GMT) on Saturday was:”like an atomic bomb”, the Sunday Telegraph reported. As leaking crude from the Lac-Mégantic disaster continues to affect nearby towns and water systems, growing numbers are demanding to know why trains carry crude and other toxic hazards through populated areas? We understand that in 1864, a group of businessmen from Bangor obtained a charter from the State of Maine to construct a railroad from Bangor to Moosehead Lake. The first president of the line was Hannibal Hamlin. In 1868, the State of Maine granted 75,000 acres to the company for the construction of the railroad. In 1891, the Bangor and Aroostook Railroad (BAR) was incorporated combining the Bangor and Piscataquis and Bangor and Katahdin Railroads. In 1893, a BAR train operated to Houlton. One year later, the main line reached Caribou and the branch to Fort Fairfield was completed. By 1905, connections were made to Patten, Limestone, Ashland, and Van Buren. Also in that year, the railroad reached to the deep water port of Searsport. We understand that initially, the pulp and paper industry constituted the primary source of traffic for the BAR. Subsequent major sources of traffic expand beyond forest products to include toxic chemicals and most significant presently, petroleum products such as crude oil. In 1995, Iron Road Railways bought the Bangor & Aroostook. In January 2003, the BAR assets were acquired by Rail World, Inc. and the name was changed to the Montreal, Maine & Atlantic Railway which currently owns 510 route miles of track in Maine, Vermont and Quebec and employs approximately 170 people. The MMA operates about 15 trains daily with a fleet of 26 locomotives. Main-line operations are conducted regularly between Millinocket and Searsport, Maine, and from Brownville Junction, Maine to Montreal, Quebec. Service is also provided between Farnham, Quebec and Newport, Vermont to connect with the Northeastern U.S. Westbound trains to Montreal are pre blocked for Canadian Pacific destinations in the U.S. and Western Canada. MMA connects with seven Class I, regional and local railroads and provides the shortest, most-direct rail link between Northern Maine, Saint John, New Brunswick and Montreal. In addition, MMA offers access to port facilities on the Atlantic at Saint John, New Brunswick and Searsport, Maine. 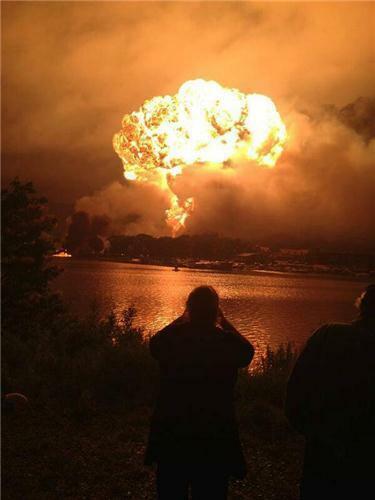 We understand that the company has admitted that Montreal, Maine & Atlantic-operated train equipment including 73 railcars containing pressurized crude oil from Baaken North Dakota and five locomotive engines had been abandoned stationed in the village of Nantes – about 7km uphill from Lac-Megantic – during an overnight driver shift-change. 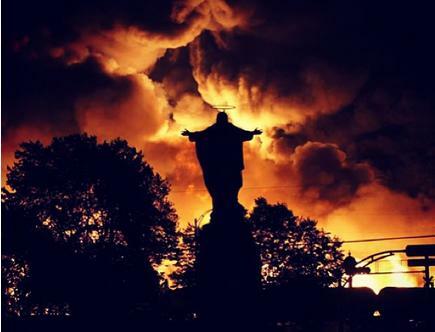 The Sunday Telegraph reported that Bernard Demers, who runs a restaurant near the blast site in Lac-Megantic centre-ville, said the fireball that followed the derailment at around 01:00 (05:00 GMT) on Saturday was “like an atomic bomb”. We understand that earlier, the train had been travelling from the Bakken Field in North Dakota to a refinery in Saint John, New Brunswick, travelling on portions of track operated by Montreal, Maine & Atlantic whose 800+km rail service extends from Maine, to Vermont, to Quebec to New Brunswick. As oil leaking from a derailed train in Lac-Mégantic, Que., travels downstream, many are asking why dangerous cargo was being routed directly through a populated riverside town centre – and why would 77 railway tankers filled with crude oil be abandoned / unattended and ‘parked’ several miles uphill from this town? It’s hard for anyone to imagine any ‘emergency break’ system which could hold such immense weight from eventually rolling if sitting on a hill. About 80 kilometres downriver from the town of Lac-Mégantic is the community of Saint-Georges, a town that draws its drinking water from the same river that passes by the site of the deadly explosions. Since the explosion, the crude oil being carried by the train has leaked into the nearby waterways, travelling downstream to Saint-Georges.